Summary: Marcus Luttrell and his team set out on a mission to capture/kill al Qaeda leader Ahmad Shahd in late June 2005. The team are left to fight for their lives in one of the most valiant efforts of modern warfare. War films are a dime-a-dozen… bad war films are even more common. It’s for that reason that is okay to be a little nervous when approaching Lone Survivor. Even the fact that it has a known actor like Mark Wahlberg in it doesn’t make necessarily a good film either… after all the man formerly known as Marky Mark has delivered some pretty bad turds over the years. Then there is the Peter Berg factor, yes Berg has shown over the years that he can create some masterpieces, just as he did with Friday Night Lights, but then he was also the man responsible for Battleship. Luckily for movie fans out there Lone Survivor falls into the realm of good war films. So good in fact that it deserves to be mentioned alongside films such as The Hurt Locker and Black Hawk Down. Yes Peter Berg served his time with the studio and worked on Battleship and has now once again been allowed to show the world what a fine filmmaker he really is. The film itself is based on actual events that happened to Marcus Luttrell (Mark Wahlberg) during a daring raid in Afghanistan to capture notorious Taliban leader Ahmed Shah (Yousuf Azami). Soon Luttrell’s group, which also contains Michael Murphy (Taylor Kitsch) and Matt Axelson (Ben Foster) find themselves deep under enemy fire after having to make a huge moral call. Worse still is the fact that they are cut off by their leader, Erik Kristensen (Eric Bana) as their communications have all gone down. There is little doubt that this is film is made ten times better under the direction of Peter Berg. 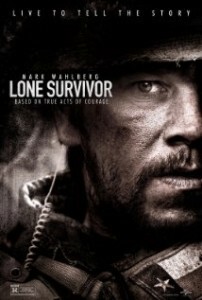 Just like he did with Friday Night Lights Berg makes Lone Survivor feel like you are watching a documentary. The dialogue was his script his natural and just because he has a big name like Eric Bana in a role doesn’t mean that Berg decides to give his A-lister any extra on screen. Likewise Berg doesn’t hold back on the violence in this film. The film is set on the battlefield and it is obvious that Berg not only wants his audience to see that the men involved in this mission were not only heroes but he also wants people to realise just how tough it is for men and women on the front line. Not only does he show this with some very confronting war violence but also by some extremely intense scenes that show the moral decisions that soldiers have to make while going about their jobs. In fact the highlight of Lone Survivor is the scene where Luttrell and co are faced with a very big ethical dilemma. Do they shoot dead some unarmed young Afghanis or do what the law says and let them go, knowing full well that the latter option is likely to bring even more repercussions for the soldiers. As the soldiers discuss what is best to do Berg heightens the tension to a level that most filmmakers can only dream about achieving. Lone Survivor really isn’t a film about the actors in it, which is made obvious by the fact that an actor of the calibre of Eric Bana is in a pretty much ‘blink and you’ll miss him’ role while the likes of Ben Foster and Emile Hirsch are also in restricted roles. To his credit Mark Wahlberg delivers even when some of the scenes seem to be above his usual acting talent, while Taylor Kitsch again silences his critics with a worthy performance as well. This is one film that is certainly a gripping, yet also very tough watch. The violence is unrelenting but Peter Berg does what he sets out to do and that is show the audience just how brave the men involved in this raid were. Lone Survivor is one of the finest war movies you will ever see. Other Subculture Media Reviews of ‘Lone Survivor′: Please check The Good The Bad The Ugly Film Show Ep #68 for our full Lone Survivor review.